…the tough gets some wire, glue, a small piece of plywood, a bunch of phillips head screws and melted Pringles lid! 🙂 Which is what we went through trying to Band-aid my broken ski. 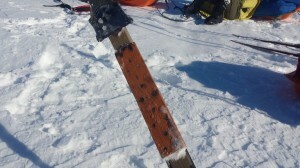 Yes, of all things to happen on this expedition a broken ski was not in my top 10. Unlike my earlier Iceland crossing on the Sprengisadur route we did not have a spare set to fall back on either. On the bright side though, there was 'only' around 200kms left to go when it happened, so could have been worse, I guess *shrug*. It was day 19 when I suddenly became quite aware of a very distinct dragging/stopping sensation building each time I slid my right foot forward. Initially I thought my ski had started icing up underneath (which can make it feel like you are moving cement), but since I did not have my glide wax at hand and were not long from stopping for the day, I powered on to not waste time. 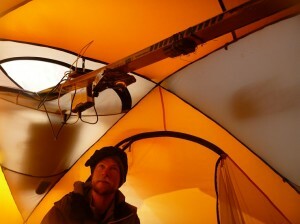 When I grabbed my ski to secure a guyline as we set up camp, the problem became glaringly obvious. The lamination on the bottom of my ski underneath my foot had somehow been damaged, and I imagine had been slowly catching more and more on the ice to eventually become the slightly jagged diagonal tear across the width of the ski I was seeing now. This of course meant the structural integrity of the wood inside was affected too. 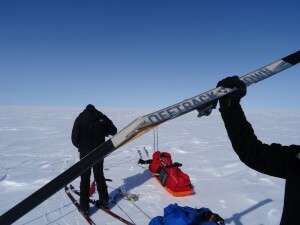 That night we brought my ski inside the main tent and our guide Robert set about shaving down the jagged edges of wood and plastic which were poking out underneath. Then, after putting some glue in place, wiring it tight to set overnight and munching through a particularly tasty dinner, I went to bed with my fingers crossed for a smoother ride in the morning. 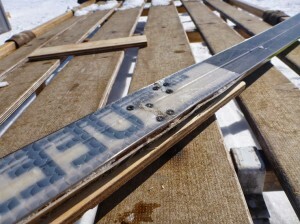 Unfortunately 15mins into the morning the integrity of the wood "wood" not hold any more and with a very audible snap the ski broke in half. So, off they came and on I went by foot. Luckily it had been a nice cold night (…nice?…) and the ground cover had crusted over, allowing me walk for the most part without my boots sinking through which was appreciated. Although it must have been a few days in the making, my ski finally broke at probably the best time possible (other than never *chuckle*). Why you ask? Well, because we were on our approach to the abandoned Dye 2 station, where we would have the chance to scavenge for some materials and try repair it better. In the meantime, when I finally reached the rest of the team at our first break stop, I placed a skin back on the ski to help keep it in one piece until we reached the station, which was still a good few hours away on the edge of the horizon. 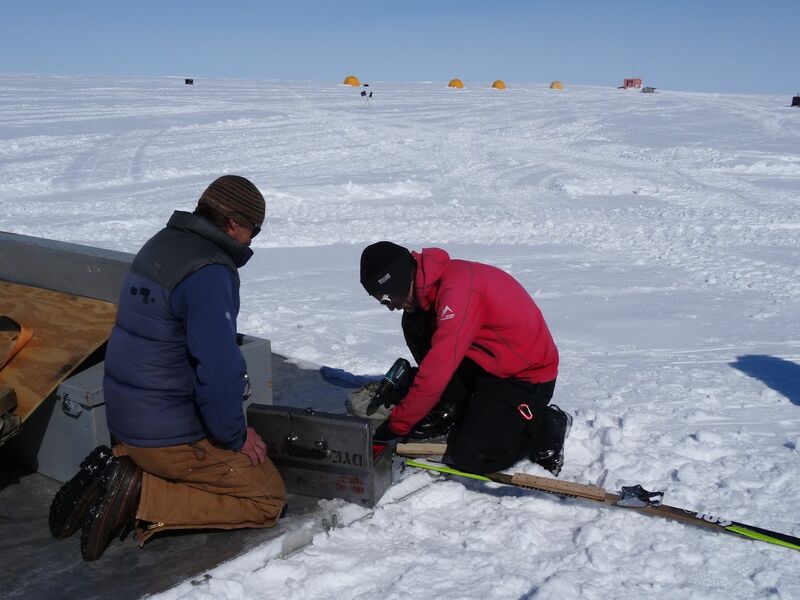 The National Science Foundation still maintains a small base next to the Dye 2 station from April to August, so pilots can train and practice their landing and take-off for Antarctica trips. During this time the base is manned by one extraordinary gentleman named Drew and his incredible wife Silvi, and they have been doing so for each of the last 8 years. ….and as luck would have it, they arrived with a couple of crew to start setting up camp two days before we did! CAN WE FIX IT! YES WE….. CAN CERTAINLY TRY TO DO SOMETHING GOOD ENOUGH THAT WILL ALLOW YOU TO CONTINUE ON YOUR WAY WITH YOUR SKI IN ONE PIECE, ALBEIT STILL WITH DRAG AND MAKING YOU WORK BLUDDY HARD BUT HEY, YAY! Drew greeted us with a smile, gave us use of a power drill, gave us a bunch of screws, gave us a piece of ply to cut a reinforcing piece for the ski, including a spare (which we needed in the end too). Honestly, he saved us a lot of time and me a lot of pain. As you can see from the photos, Robert went to town trying to make sure my ski stayed in one piece and securing the jagged pieces underneath as best possible. A lot of screws from the top down, screws from the bottom up, and screws into the side as well. I kept the skin on to protect the bottom until we made camp, at which time we melted a couple of Pringles lids over the underside to seal the screws and fill the gaps as best possible. This would/should stop snow/ice/liquid seeping in and hopefully give me some glide back with my steps. 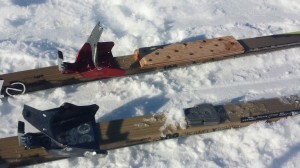 One word describes how I felt the next day putting on new right ski version 2.01… AWESOME! 😀 It was almost as good as new, the melted lids had sealed the bottom quite well, so I could pretty much slide my ski forward when walking and it was just so much easier than it had been. But…. it didn't last forever *chuckle*. When we hit the danger area for glacial lakes a few days on trouble came calling again. In this region we were going through some 'wet' areas, and as such the reinforcing piece of ply holding my ski together (and indeed my ski itself) soaked up a lot of liquid. This left my ski feeling like a fairly flimsy piece of wood on my foot and I had to literally step the ski each time like a shoe with no forward movement at all. In the end we had no choice but to stop again and replace the ply we had screwed on with the spare Robert had the foresight to make back at the station. To put it bluntly, if we did not have that backup piece with us, we would not have made our pick up. That's how bad the ski was by this time. Had to laugh 🙂 ….right after replacing the reinforcing piece with the spare – this time by hand with a Leatherman tool – my binding broke! 😀 Yes, we were all psyched! Ready to go again! 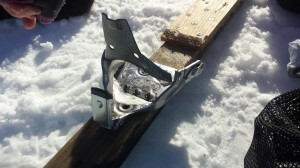 Then, as my boot went into my binding there was a nice little metallic 'click!' sound and, well, the picture says it all. I still shake my head and have a good giggle when I look back on how much trouble that ski gave me. It definitely added to the challenge that is for sure, but hey, end of the day it still got me home. Well, time to sign off for this week.